Investing in REITs without understanding the differences between internal and external (fee based) REIT management teams can impact bottom line results far more than most investors realize. Here are some recent developments which illustrate how important governance can be. Government Properties Income Trust (NYSE: GOV), Select Income REIT (NYSE: SIR), and Senior Housing Properties Trust (NYSE: SNH) are each managed by REIT Management & Research (RMR), an external manager controlled by the Portnoy family. RMR gets paid large fees for growing assets under management, (even to the detriment of shareholder returns). Therefore, RMR and shareholder interests are clearly not aligned. 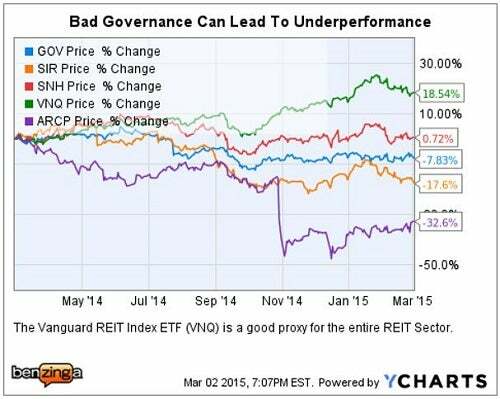 These RMR managed REITs have underperformed compared to the broader REIT sector. This situation does not appear likely to change any time soon. RMR has demonstrated a willingness to do whatever it takes to retain voting control of the REIT trustee boards which approve these lucrative management agreements. An ETF or REIT mutual fund may be a better choice for investors looking to diversify their portfolio through ownership of commercial real estate, but lack time for the due diligence. The total return for the Vanguard REIT Index ETF (NYSE: VNQ) for the past 12 months, including the 3.48 percent dividend yield, was just over 22 percent. Lose The Battle - Win The War? 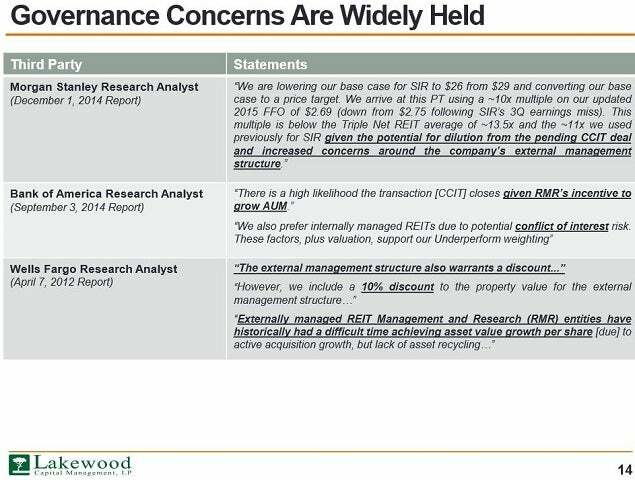 Large SIR shareholder Lakewood Capital Management (Lakewood) has gone to great lengths to publicly challenge RMR's actions as being self-serving, and not in the interests of Select Income REIT shareholders. 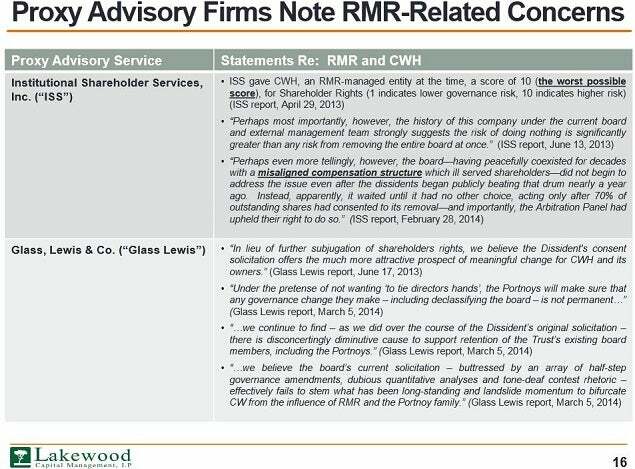 Back in June 2014, Lakewood published a scathing letter with multiple exhibits detailing the convoluted efforts engaged in by RMR to keep control of the SIR board, including a dilutive May 2014 issuance of 8,000,000 new common shares. 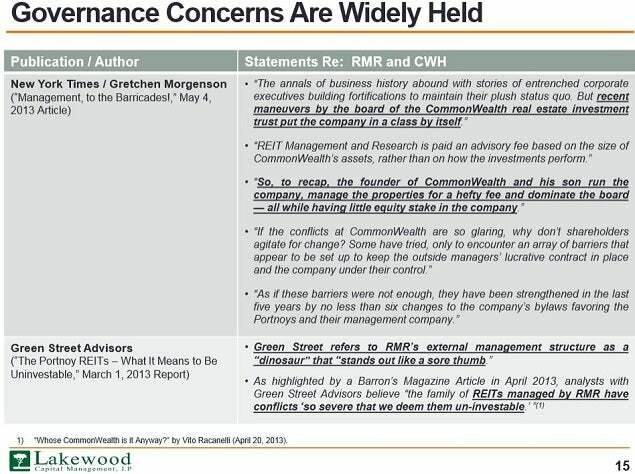 That fight appeared to have ended after the Portnoy/RMR group lost control of the former CommonWealth REIT (CWH) -- the then largest stakeholder in SIR -- which effectively controlled who appointed the board. However, the ever resourceful RMR/Portnoy family adroitly used the treasury at its RMR managed GOV REIT, to buy out the shares of CommonWealth, (now Equity Commonwealth Trust), at a significant premium, thereby retaining control of Select Income REIT. 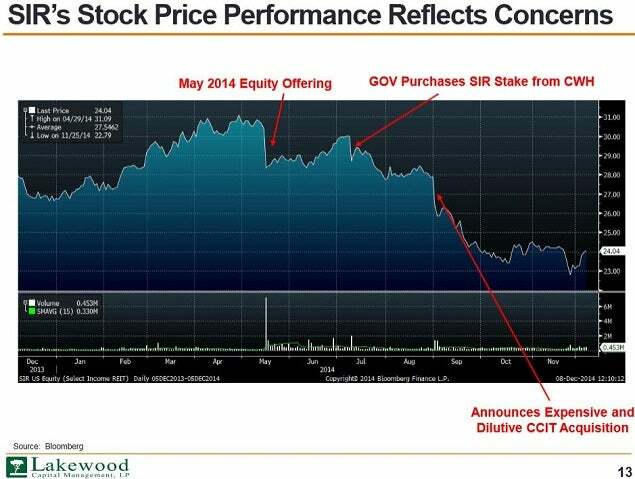 Lakewood along with the rest of the Select Income REIT shareholders, suffered a loss in value, as SIR shares slid after that transaction. (Shares of GOV traded lower on the announcement as well). 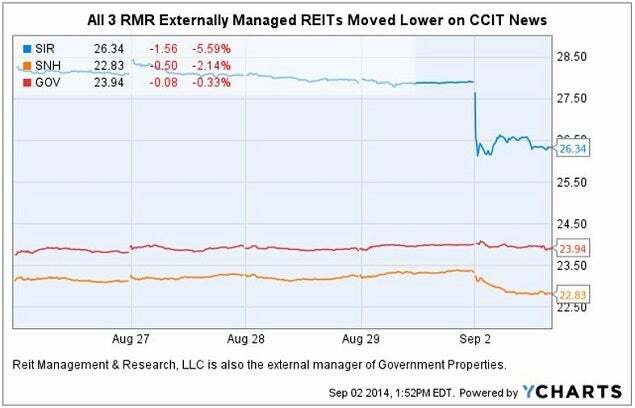 The next major event occurred in early September 2014 when RMR decided to have Select Income REIT purchase the non-traded CCIT portfolio of assets from American Realty Capital Properties Inc (NASDAQ: ARCP) for $3 billion. 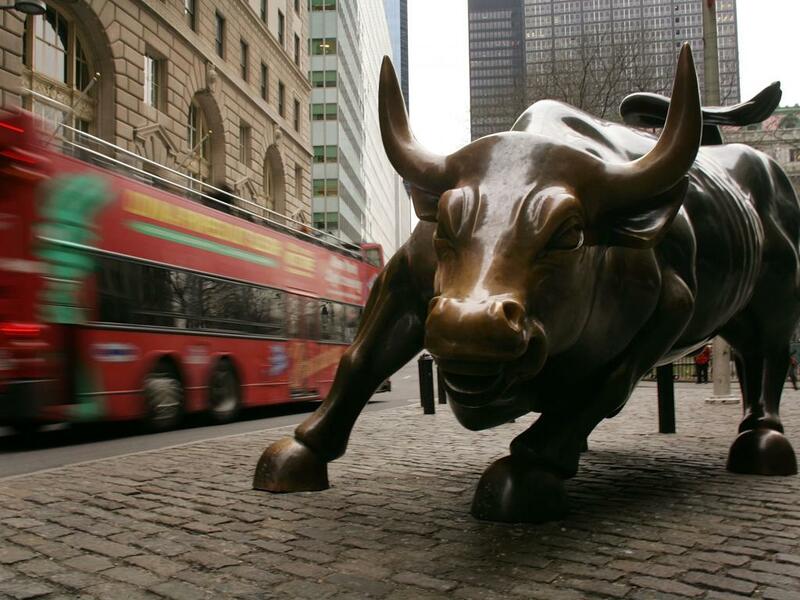 This agreement was negotiated with ARCP's former management team, led by Chairman Nick Schorsch and President David Kay, prior to ARCP's much publicized, ill-fated agreement to sell its Cole Capital business to the then Schorsch controlled RCS Capital. (The Portnoy's strategically used the RMR managed Senior Housing REIT (SNH) to acquire the CCIT healthcare related assets, leaving the net lease assets for SIR, which was logical). However, the weighted average cap rate for the acquisition was ~5.8 percent. The high price paid for the assets contributed to this being a dilutive acquisition for Select Income REIT shareholders. Once again, SIR shares fell on the news. Ironically, lost in the confusion over the widely publicized ARCP REIT management accounting scandal/cover-up, was the fact that the CCIT sale at that price to SIR was a very good deal for ARCP shareholders. (Regarding ARCP governance issues, it is notable that the transition over to an internal management team is what ended up raising the accounting red flags). Fast forward to January 2015, and a second Lakewood letter is published, (containing a link to a scathing slide presentation), in the attempt to elect a nominee to the SIR board of trustees. Here are three presentation slides which contain negative comments from investment banks and industry analysts. Fast forward again to Mar. 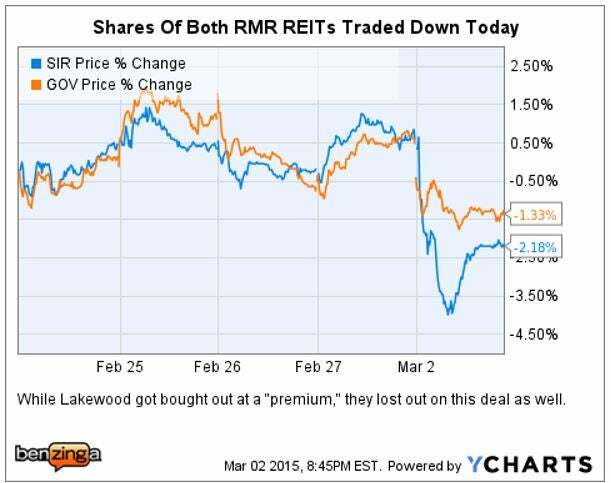 2, 2015, when Government Properties shareholders wake up to learn that RMR had agreed to a GOV buy out of over 3,400,000 Lakewood fund shares for $27.85 per share, or a 12.8 percent premium over the prior SIR close of $24.69. 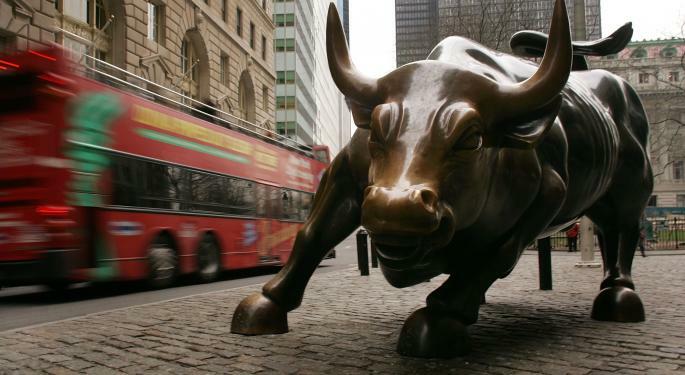 A company release stated, "GOV views this investment as a unique opportunity to purchase a large block of SIR shares at a reasonable premium to the trading price. GOV believes that its continuing ownership of a significant stake in SIR will provide security and increasing cash flows to support GOV's dividends." GOV's purchase of the SIR shares from Lakewood will be funded using cash on hand and drawings under GOV's unsecured revolving credit facility. RMR has increased its controlling interest in SIR, while the rank and file shareholders have just lost their biggest ally. When REITs are very small, or recently listed on a public exchange, it can be cost-effective to have an external manager. However, as REITs grow their assets to $500 million or larger, still being externally managed should be a warning sign for investors to take a closer look at the agreements.